A lot of the US papers are carrying reviews of Roman Polanski's Oliver today so we thought we'd bring you a bit of a roundup of what they're saying. We'll kick off though with the only UK paper to get in on the act so early: the Standard. Nick Curtis was at the British premier of the film last night and his review is headlined The Best of Twists, so there's no grey areas there then. Polanski streamlines but generally does not sanitise the orphan Oliver's story. Inviting inevitable comparisons with his own wartime childhood in the Cracow ghetto, he has cut away subplots and characters to concentrate on how awful it is to be a child, alone and poor. Curtis says the film has urgency and pace, and Polanski brings the same "delicacy and sureness of touch" to Oliver that he showed with The Pianist. As for the 'Fagin question': "Ben Kingsley looks and sounds much like Dickens's original racist caricature of a Jewish miser, [but] Fagin's race is never alluded to here and he is a warmly sympathetic character... This strikes me as an admirable way of neither airbrushing out nor apologising for a literary genius's most offensive attitudes." The SF Weekly again draw parallels between Oliver's life and Poalnski's "own brutal boyhood", which only makes it harder for them to declare the movie "a disappointingly flat, disjointed affair". 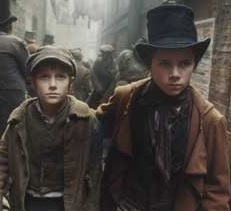 Although the beginning of the film stands up, says the paper, it's when "the focus shifts away from Oliver and onto Sykes, Nancy, Fagin, and a colleague of Sykes', the carrot-topped fop Toby Crackits" that Polanski loses it a bit and scenes start to feel "cobbled together". "Frankly," the review continues, "if Polanski's name were not up on the screen here, few would guess that he even showed up on the set, so lacking is the film of the qualities that have made his other movies so memorable." Every frame looks like some gorgeously oppressive, low-lit Rembrandt painting, but the story moves with paint-drying slowness, and most of the cast seems to be posing rather than acting. Finally in the St Petersburg Times (not a paper we read often) their reviewer claims "The scenery is about the only thing worthy of note in the latest film adaptation of Oliver Twist, calling the film "dutifully dull" and "a superior rendition of the same old thing but it's still the same old thing.". While Kingsley's performance is "grotesque, over-the-moon" and "embarrassing". Not good then. Which will annoy Mr Polanski who apparently has high hopes for Oscar nominations. The film is released in the UK on 7 October.